Believe it or not, it wasn’t until a couple of years ago that I discovered Mary Berry, even though she is the author of more than sixty cookery books and has a reputation as the queen of cakes. It might explain why Mary Berry’s Ultimate Cake Book is so good though, as Mary has been around long enough to know how to put together a really good cook book. It really doesn’t matter whether you are an experienced cook or just starting out, you will find this book really helpful! 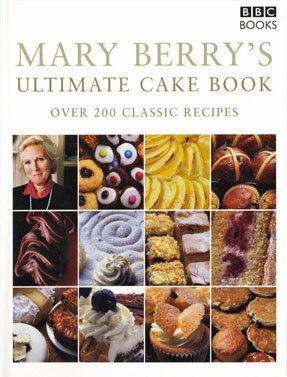 There is a picture for every recipe in this book which is handy if you have never heard of some of the cakes or cookies and it’s always nice to see what your finished product should look like. Mary writes in a very straightforward way, this is not boutique baking, seasonal, organic etc… its not buzzword cookery from TV Chefs – this is honest home baking. Quick, simple, satisfying recipes that appeal to everyone, plus a few fancy ones for special occasions, from someone who knows what she’s talking about!